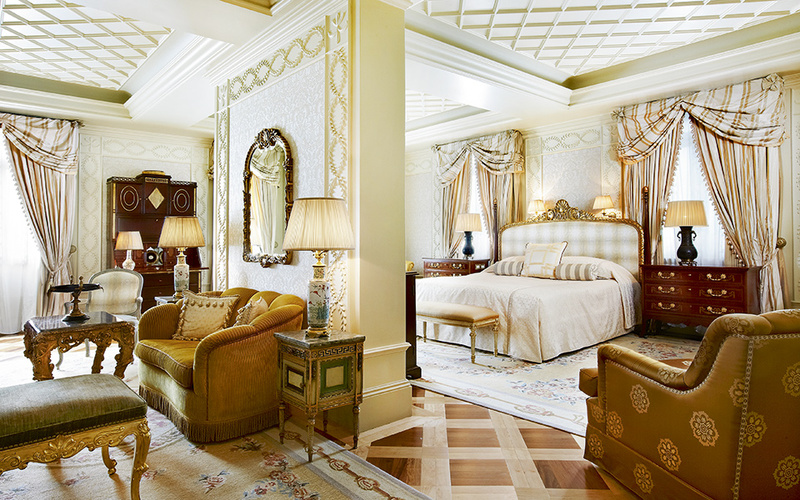 The Grande Bretagne Royal Suite. A hotbed of political intrigue and VIP playground, this magnificent hotel has been eyewitness to some of Greece’s most dramatic moments. 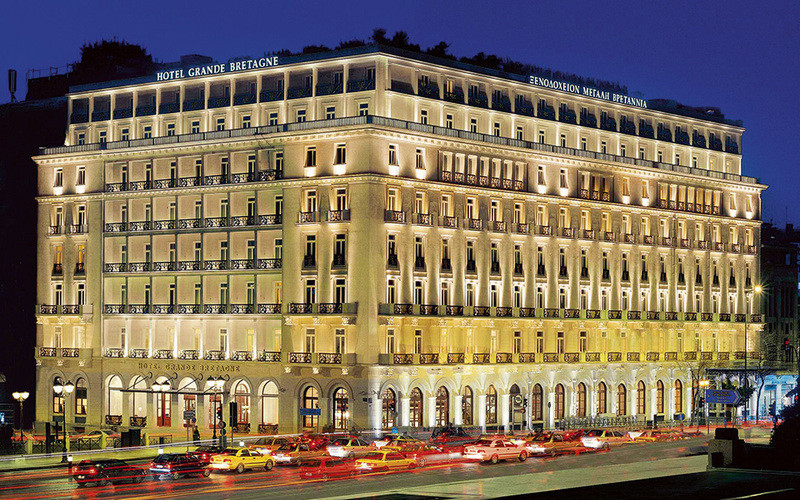 As you head down chic Vassilisis Sofias Avenue to Syntagma Square in the early evening, there is one building that draws attention as Athens’ most iconic hotel shines through the twilight gloom: Hotel Grande Bretagne. This historical neoclassical building, inspired by the Roman Agora beneath the Acropolis, deviates from the linear design of traditional classicism. It has stood in the same spot since 1842, taking pride of place, as the timeless symbol of Athenian grandeur. Although in its infancy compared to other city landmarks, this hasn’t prevented the Grande Bretagne from occupying a front-row seat throughout many of the stormy events that have shaped modern Greece. During World War II, Winston Churchill narrowly escaped an assassination attempt when leftist National Liberation Front (EAM) guerrillas at the last minute called off a decision to detonate a bomb they had placed in the basement of the hotel. In one of the fifth-floor suites, the interim national unity government established after the fall of Greece’s military dictatorship, came into being under Prime Minister Constantine Karamanlis. In 1974 Cypriot Archbishop Makarios addressed the Greek people from a second-floor balcony some months after the Turkish invasion of Cyprus. The recent financial crisis has been no exception. During rioting, the hotel’s marble steps fell victim to violent protesters, who, using hammers, broke off chunks to throw at police. Nowadays, the clashes in Syntagma Square belong to the past and the marble steps are once again providing a hospitable home to resident dogs. Passing the doors is like stepping into a decompression chamber, sheltered from the city noise, where visitors are transported back to the ambience and opulence of late 19th century Athenian salons. Ionian columns, architectural details that have been hand carved with care, the shine of gold leaf and an array of fine antiques recreate the atmosphere and grandeur of the best of Europe’s original 19th century hotels. After an investment of 100 million euros by the current owners a decade ago, the hotel was returned to what the founders had in mind back in 1874 – or even better. 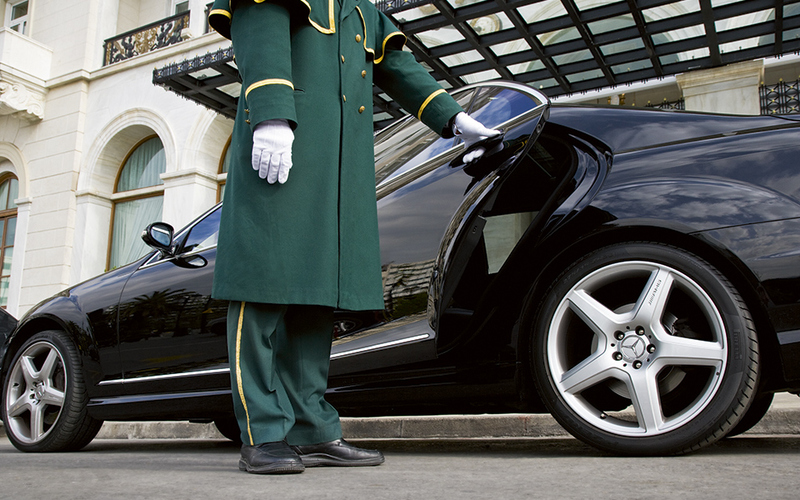 The Grande Bretagne hotel has long been an opulent point of reference in the city. The original building dates to 1842, when a wealthy Greek expatriate businessman commissioned Danish architect Theophil Hansen to erect a private mansion. However, in 1874 the need for luxurious food and accommodation for rich travelers from the West led to its conversion to a hotel. The foundation of the Grande Bretagne was not the result of a considered move by some wealthy investors and knowledgeable consultants, but rather a story involving a lot of risks. The collaboration between two unlikely partners proved to be an inspired move: one was the adventurer Savvas Kentros, who rose from peasant origins to become a self-made hotel proprietor; the other, a talented chef named Efstathios Lampsas, who started out as a grocer’s assistant before progressing to the kitchen of the Greek royal palace and, later, as maître d’hôtel to one of the richest men in France. Lampsas, in fact, is considered the father of Greek hostelry. “What the Ritz is for Paris, Lampsas is for Athens,” remarked the tourism magazine Xenia in June 1949. Within a decade the hotel was ranked the capital’s finest. As a result of its reputation, wealthy, educated travelers bent on exploring Greece soon found rooms hard to find. “After the Parthenon, the building in Athens best known to foreigners is the Hotel Grande Bretagne,” wrote René Puaux in Revenons en Grèce in 1932. At a time when the tourism industry was extremely rudimentary, the hotel owners were so innovative that when they sought financial backing from Thomas Cook in 1912, the owner of famous British travel agency said he wasn’t interested as long as farm animals shared passage on ships with people and there were no proper roads linking Athens to the archaeological sites. “After the Parthenon, the building in Athens best known to foreigners is the Hotel Grande Bretagne,” wrote René Puaux in Revenons en Grèce in 1932. 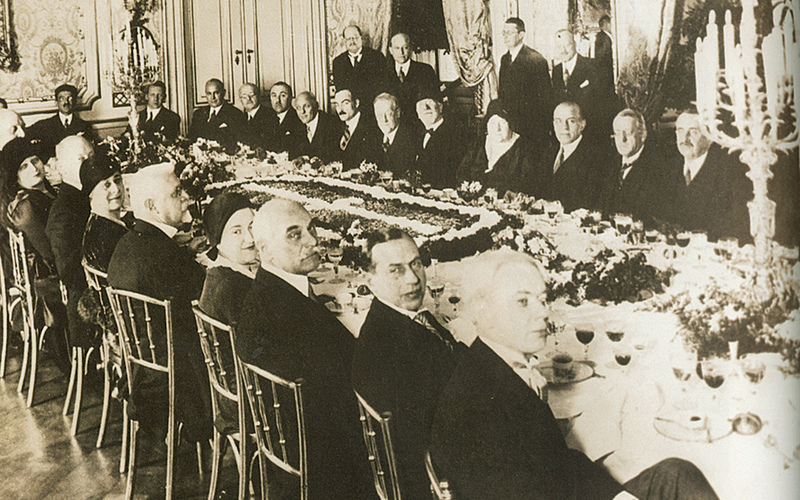 Eleftherios Venizelos and members of his cabinet give a dinner for a Turkish delegation as part of a policy of rapprochement in the wake of the Asia Minor disaster in 1930. 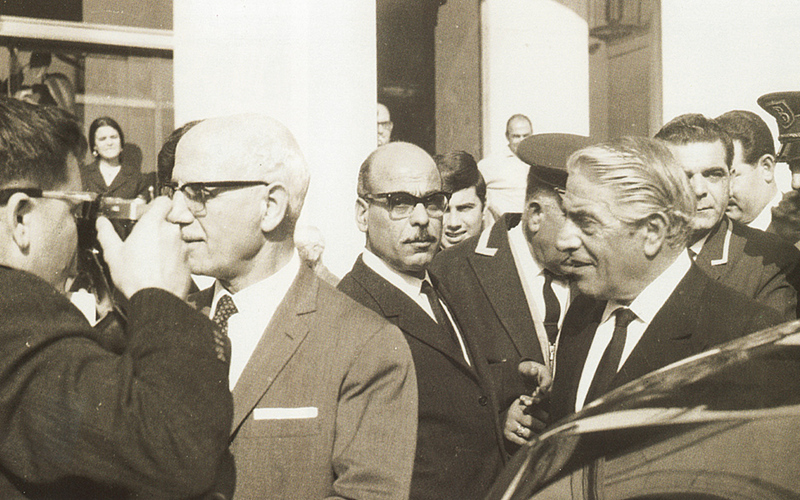 Aristotle Onassis leaving a press conference in 1968. 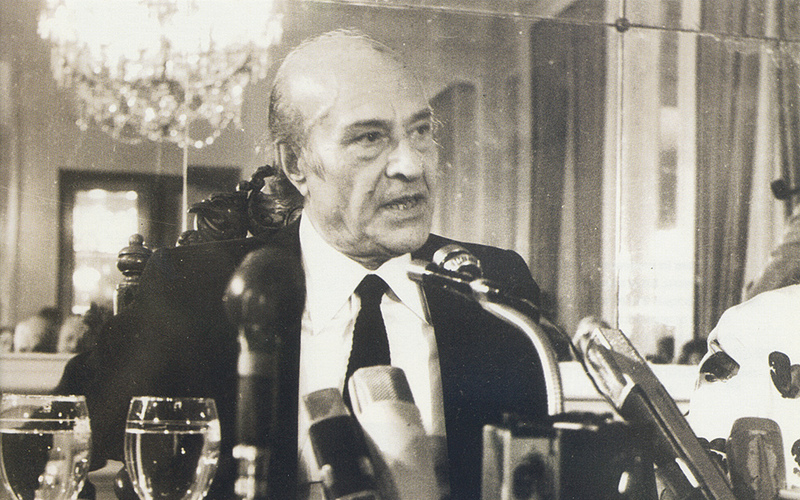 Greek poet Odysseus Elytis at a press conference in 1979, the year he was awarded the Nobel Prize for Literature. 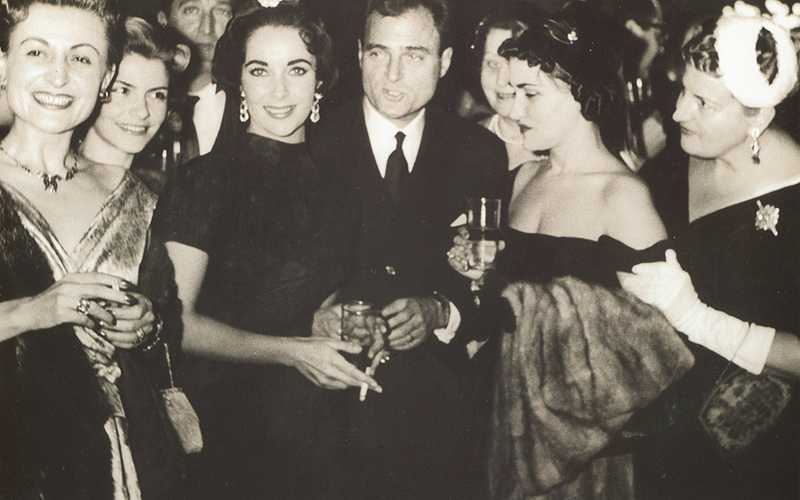 Elizabeth Taylor with husband No 3, Mike Todd, in 1958. Throughout its history, the hotel has stayed ahead of its time. In 1894 it hosted the first dinner dances with live orchestras in the city. Two years later it was a sponsor of the first modern Olympic Games, and even later, in 1952, hosted Greece’s first post-war beauty pageant. It has always been in the news during major events – the international news agency Reuters used it as its headquarters in the 1950s and 1960s when it was home to prominent politicians such as Nikolaos Plastiras, Sophocles Venizelos and Georgios Papandreou. Its halls have also echoed to the sounds of society gossip, such as when the soprano Maria Callas in 1957 refused to sing at the Ancient Theater of Epidaurus, forcing a government minister to visit her in her hotel suite to persuade her to appear. Meanwhile, German writer Heinrich Böll was in the hotel lobby when he was informed that he had been awarded the Nobel Prize for Literature in 1972. 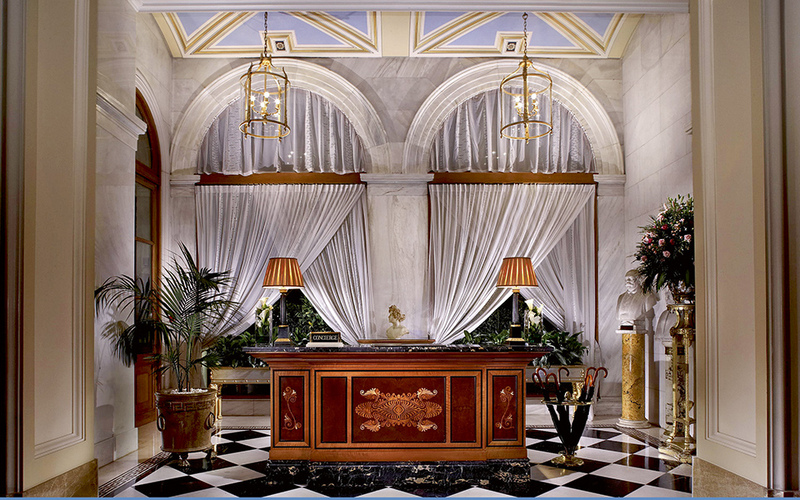 The Hotel Grande Bretagne has always been a point of reference. It is the place to be for the wealthiest and most influential people when in town. Callas, Greta Garbo, Sting, Elizabeth Taylor, Rudolf Nureyev, Laurence Olivier, Sophia Loren, Sean Connery and Francis Ford Coppola are but a few of the rich and famous who have passed through its doors. It is the Greek state’s unofficial guesthouse, French President François Hollande being the most recent VIP guest. 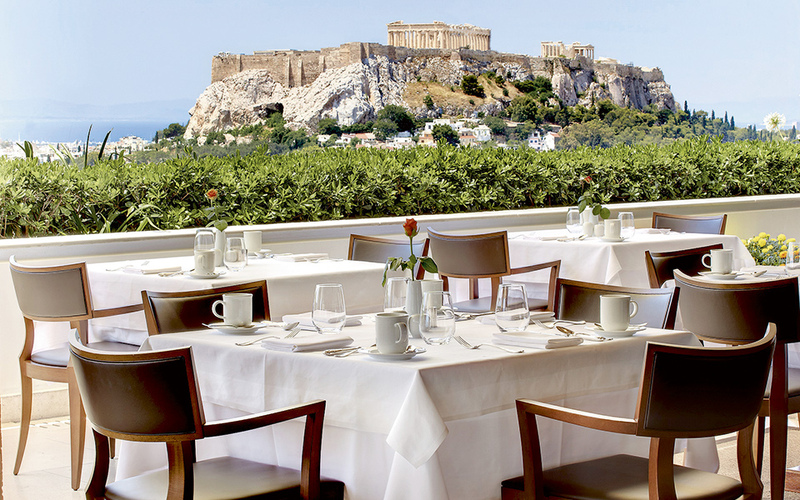 It is where local politicians, journalists and business executives hold their power lunches, a hangout for pre- and post-theater goers, and the place where wealthy Athenian families celebrate the nuptials that link their family fortunes. The hotel was fully renovated, inside and out, in 2003 to express Theophil Hansen’s original aesthetic. 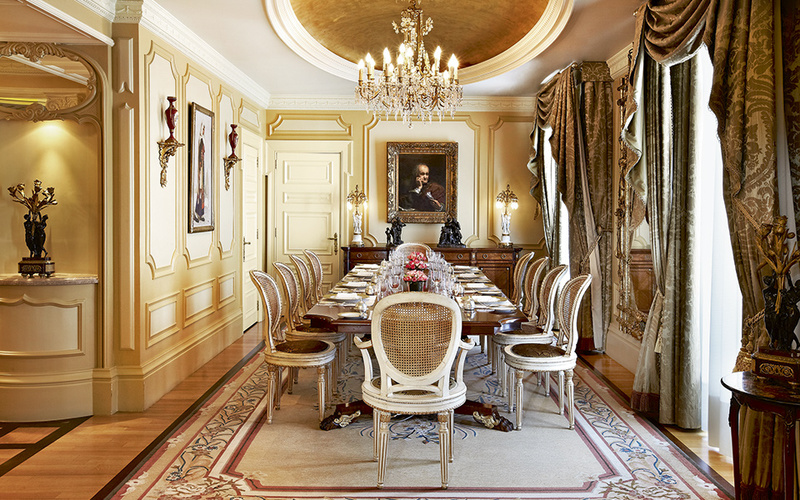 The dining room of the Presidential Suite, a 200 sq.m. luxury apartment complete with butler services. Awarded in 2015 by the distinguished Wine Spectator magazine with a “Best of Award of Excellence” for the third year in a row, the GB Roof Garden restaurant offers a menu with a wide selection of authentic Greek delicacies as well as an extensive wine list. By gazing southwards, guests cannot miss the splendor of the Parthenon. At the monastic wooden table in the impressive cellar, amid the 3,000 bottles that make up the hotel’s wine collection, try a selection of top Greek and imported wines as well as a unique pick of ports. This enticing venue can be reserved for that very private dinner party or business meeting. Sit back and relax in a leather armchair and enjoy the ambiance in front of the fireplace with your favorite cigar from the most up-to-date list in town. A drink and finger food are guaranteed and if you are a sports fan, don’t miss the theme nights held throughout the year, for Champions League games, for example. The most talked-about winter weddings are held at the Grande Bretagne. From the Grand Ballroom to the Golden Room, these beautifully decorated atmospheric spaces are different, providing a wide choice for those seeking a vintage-look celebration or an ultra-modern gathering. 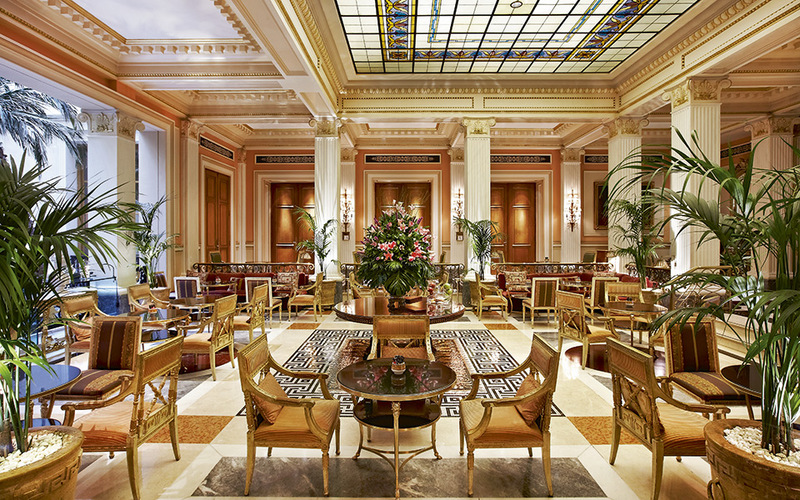 Travel + Leisure magazine ranked the Grande Bretagne among the world’s top 50 hotels in 2014. The hotel Gift Shop offers jewelry created by Greek designers, but also brand name ties, shirts and t-shirts, while the new concept GB Corner Gift & Flavors promotes traditional products from small producers under the brand name Grande Bretagne, but also Zeus + Dione’s fashionably famous handmade clothing. With an East-meets-West philosophy, attention to aesthetic detail and a wonderful welcoming aroma, a visit to the award-winning GB Spa is definitely worthwhile for its beauty, massage and stress-obliterating therapies. 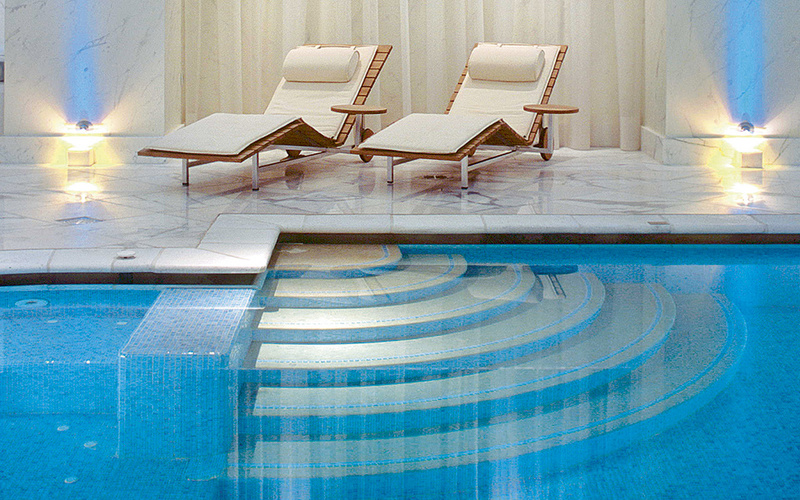 From ancient holistic rituals to the finest modern skin care, every regimen promises to indulge, soothe and transform. If there is one reason why the hotel is named the Grande Bretagne, it would have to be the potted palm-filled Winter Garden, where you can enjoy brunch or a very English afternoon tea with freshly baked scones and finger sandwiches, along with a selection of the finest teas. Situated to the left of the Winter Garden is Alexander’s Bar, named after its backdrop, an 18th-century Brussels tapestry featuring Alexander the Great entering Gaugamela. Here, guests can enjoy a classic cocktail, fine brandy or exquisite whisky while being entertained by piano melodies.